We might have made a packing mistake that has cost us £130. Gulp. Deciding whether to take our SLR camera travelling for five months was a tricky one… On the plus side it enables us to take photos that we just can’t seem to capture with our trusty, much loved compact (a Canon G12 which we use in conjunction with the SLR), but on the other hand, it is bulky, heavy and a bit of a nuisance. Especially when you also want to take three lenses and a tripod… Because otherwise you might as well just take a compact, right? So last September, ahead of our big trip across Central Asia, we did a test run in Bali with the SLR and bought the Jack Wolfskin ACS Photobag to see how cumbersome it would be. But it worked out just fine. 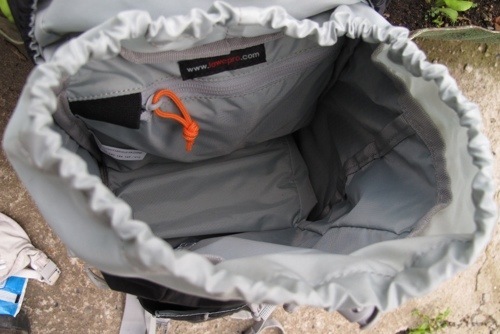 The bag made for an ideal ‘day pack’, despite being a little large. 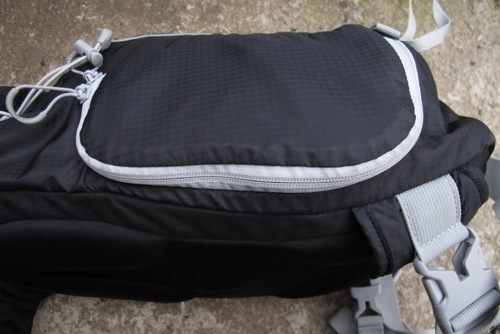 Click on the link above for detailed pictures, but essentially it has a large Velcro-strapped area for the camera and lenses, with two other sections for all the other bits you might need for the day (including space for a thin laptop or tablet). However, within a week of being on the road for the big trip, we realised the bag was completely impractical. 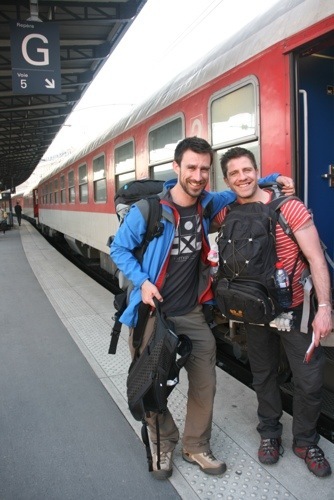 Me looking a tad top heavy with the Jack Wolfskin, on the morning we left for our Silk Road journey. While fine for a holiday in Bali, when we caught taxis to most places and stayed at guest houses for more than a few days at a time, it was a completely different scenario trying to squeeze it onto cramped mini-buses and sleep with it on sleeper trains. 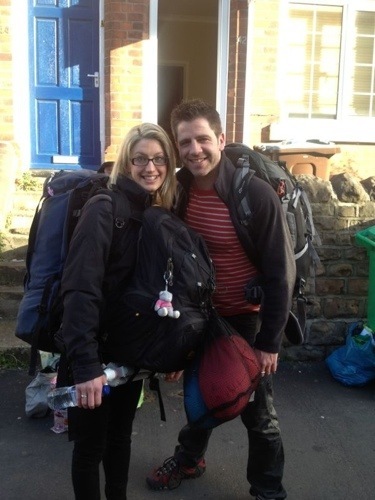 Matty sporting the giant ‘day pack’ on his front before attempting to wrestle it onto a sleeper train. In fact, it got so bad that Matty started talking about getting a new bag on an almost hourly basis. One of the main problems was its large and rigid frame, that just couldn’t be squeezed into small spaces. It was just too bulky. To cut a long, and somewhat boring story short, we have finally caved in and replaced it. We now have a tiny little SLR camera bag (relatively speaking) that fits in everything we need to carry, and can sits under all tables and awkward bus spaces with ease. But it came at a price. So in a (geeky) bid to make sure others don’t make the same mistake, I thought I would write a small review of our new bag. 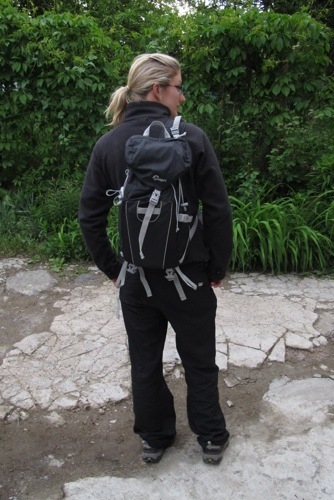 There is plenty to love about the Lowepro sling but I think perhaps the best thing is, it looks more like an ordinary rucksack than a camera bag, which is a big plus when you don’t want to attract unnecessary attention when travelling. It has just one strap over the shoulder with a support belt around the waist to prevent your shoulder from aching too much. But the real benefit of this is that you don’t need to take the bag off to get the camera out, you just undo the support strap and swing the bag to your side. It feels only appropriate, if writing a geeky post like this, to include an incredibly geeky picture of myself. So here you go. 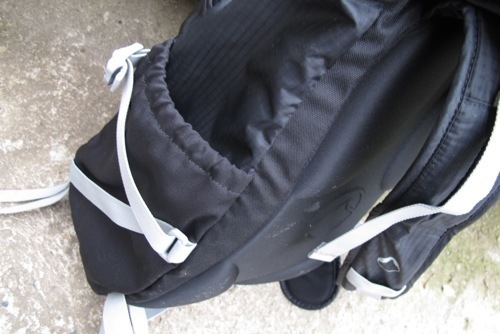 The camera is tucked away in this little section on the side of the bag, zipped up snugly, with a drawstring to make even tighter if your camera is smaller than ours. So the camera takes up the bottom half of the bag, leaving space for bits and bobs in the top half. We can also slide our iPad down into the bottom half of the bag, beside the camera, and it fits in perfectly. 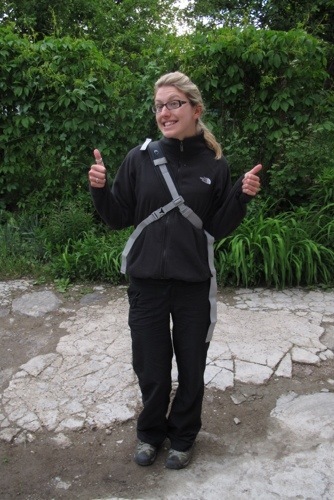 In the top half I can carry my kindle, journal, guide book etc easily. (Yes, I’m a dirty ‘flashpacker’). 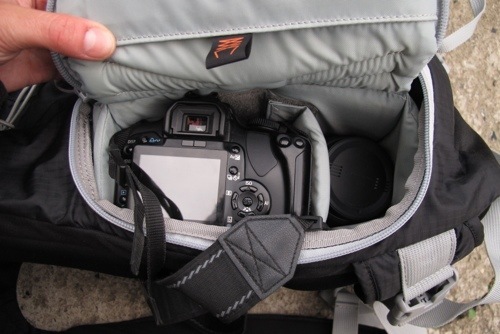 Look, it even has a little zip compartment in there where we keep our camera connectors and polarising filter etc. There is a pouch at the front, which is the perfect size for a book – and also a small zip up pocket on the top of the bag, giving easy access for smaller valuables etc, as well as a pouch in the side that easily carries 1.5 litre bottles of water. Oh, and it has a rainwater protector tucked in at the bottom for wet days. I did warn you this post was geeky. It gets better. I know, I can almost hearing you crying: “How, how, can this bag get any better? 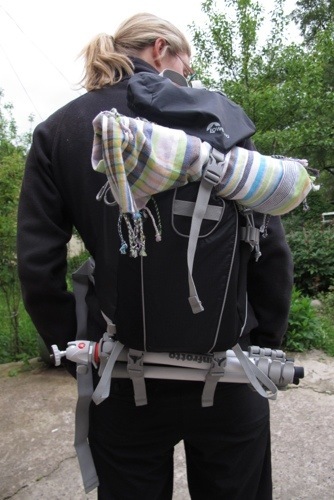 !” It has straps at the bottom to attach a tripod and you can easily roll up a jumper or pashmina and fix it underneath the strap at the top of the bag. In fact, there are so many straps that you could hang all sorts to it, and I’m not sure why, but that makes me happy. The only negative factor is the bag only really has space for one spare lens. We are travelling with three lenses so bought a little case for our small 50mm lens, which we carry in the top half of the bag. So the conclusion is, Matty is much happier and is talking less about bags. And that is definitely worth £130. This entry was posted in Recent Posts, Top Tips by Delia. Bookmark the permalink. Love that the kikoy has featured!! I think a post of its own seems appropriate in order to educate those not in the know!! It almost deserves its own name…it could be like the bruin bear of your trip!